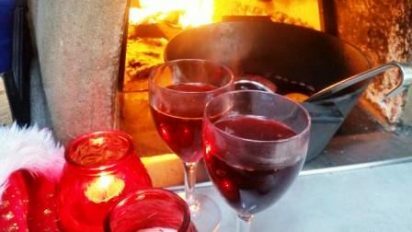 The latest instalment in our wood fired advent calendar is a batch of mulled wine from the wood fired oven. We’re using the oven like a hob here which is great as it clears the hob in your kitchen of a boiling pan and stops your kitchen getting steamed up. Do make sure you use a large heavy pan, don’t overfill it (ours was only half full) and make sure to be super careful when you’re taking it out and putting it back in the oven as it will obviously be full of hot, sweet wine. Do wear your gauntlets! 1. 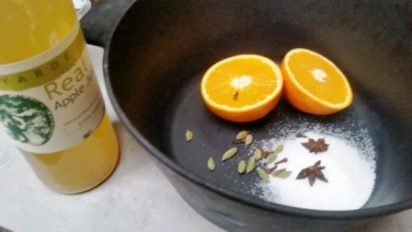 In a large, heavy pan, add a halved orange with about 10 green cardamom pods, 2-3 star anise and about 5-6 whole cloves; don’t overdo the cloves as they can be very dominant in flavour. If you have a cinnamon stick and/or a vanilla pod handy, chuck them in too. 2. 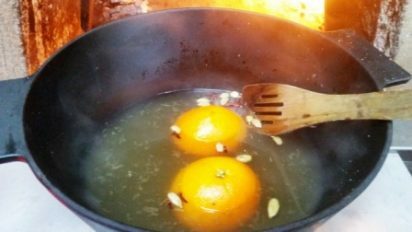 Add 50g caster sugar and a bottle (750ml) apple juice – this will add sweetness so you don’t have to add too much sugar which can make the finish mulled wine sickly. 3. Put the pan in the hot oven with a small fire burning and bring the liquid to the boil. Reduce the volume by a third which will concentrate the apple juice and really bring out the flavours of the spices. 4. Add a bottle of red wine – we used a fruity Californian malbec; lots of fruity flavours and not too tannic. 5. Put the pan back in the oven, add a few sticks of kindling to the fire if you need to to keep the flames going, and bring the wine to the boil. Pull the pan gently away from the heat so it simmers gently for about 30 minutes. 6. 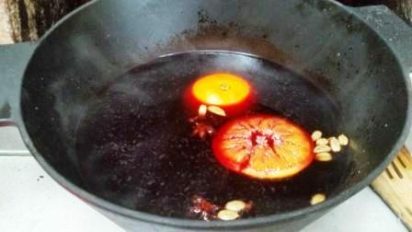 Serve hot in heatproof glasses and you can keep the pan of mulled wine warm at the edges of the oven until it’s used up. We’ve also made this with cider to make mulled apple cider – a memory of a skiing trip in Virginia when we were looked after magnificently by our host Ken and still remember coming in after skiing to warming glasses of his hot apple cider.